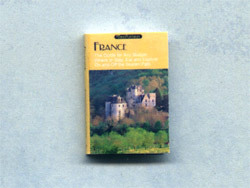 No tiny traveller will ever be lost with a TreeFeathers Travel Guide on hand! 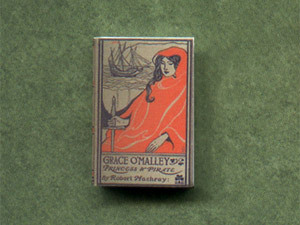 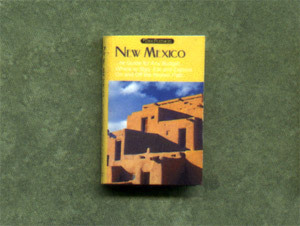 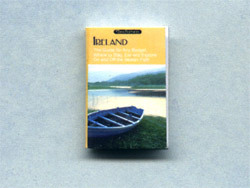 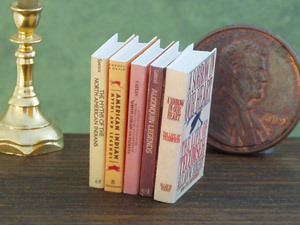 These 1"-scale miniature books feature gorgeous colorful cover photos, sure to attract attention in any miniature travel or vacation scene. 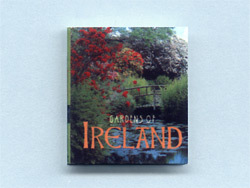 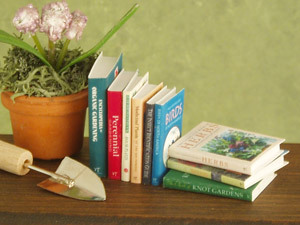 A beautiful handmade 1:12th-scale 'coffee table' book for your miniature home and garden scenes. 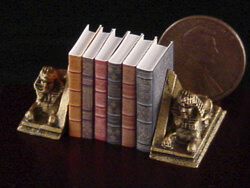 Beautiful metal bookends finished in real 18k gold leaf. 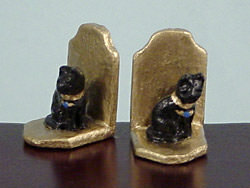 Tiny black statuettes of the Egyptian cat goddess Bast, also known as Bastet, are decorated with 18k gold collars and the Eye of Ra in gold and lapis blue. 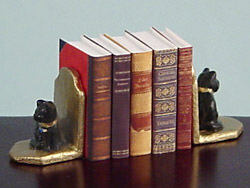 Egyptian Sphinx statuettes on pyramid bookends, handpainted in an antique gold finish. 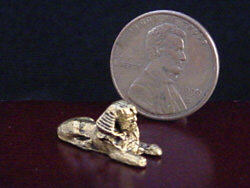 9/16" (15mm) tall. 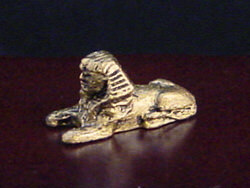 A finely detailed metal statuette of the Egyptian Sphinx, handpainted in an antique gold finish. 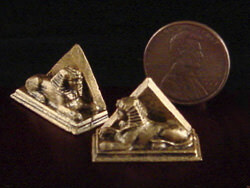 Display on a desktop or formal stand to add a classic touch to your miniature scene. 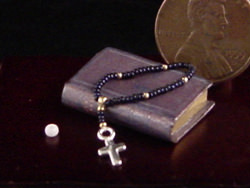 &frac38;" (9mm) tall and ¾" (19mm) long. 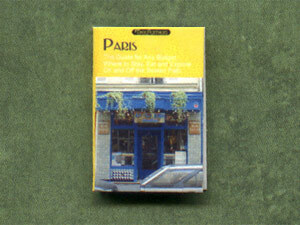 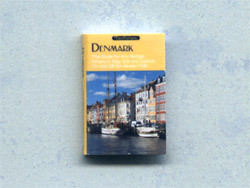 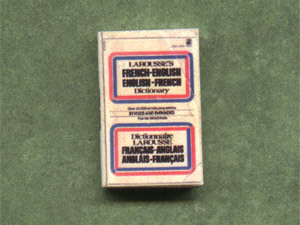 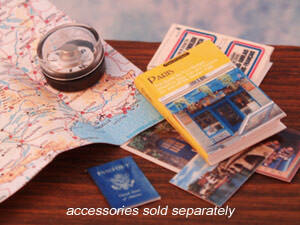 A blank miniature paperback French dictionary - indispensible for any miniature globe-trotter! 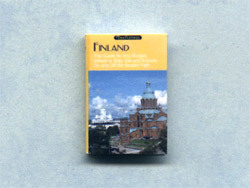 The wear-and-tear of my own battered, well-travelled copy is reproduced in full graphic detail. 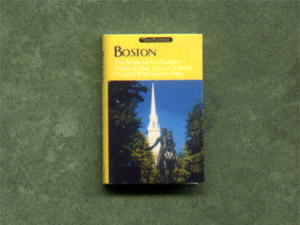 Blank pages. 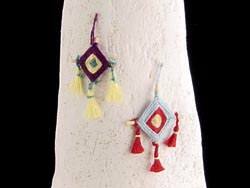 &frac58;" tall (16mm). 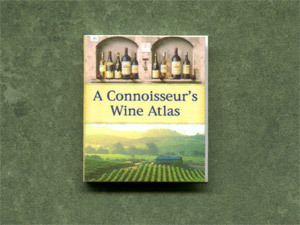 Colorful 1:12th-scale blank wine guide, a must for any miniature wine aficionado or world traveller! 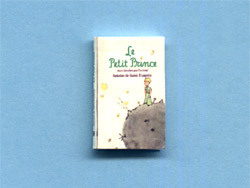 Miniature version of the classic French children's book first published in 1943, with cover illustrations by the author. 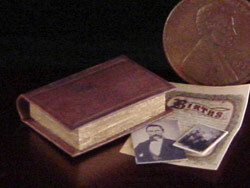 Blank pages. 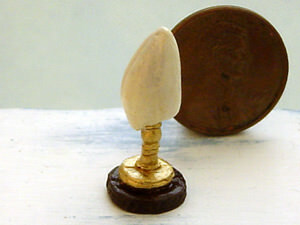 11/16" tall (17mm). 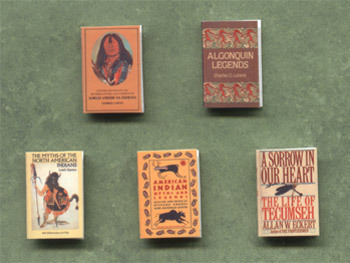 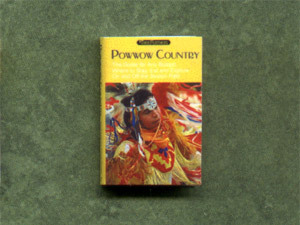 1"-scale Native American history & mythology books, a wonderful addition to any miniature library. 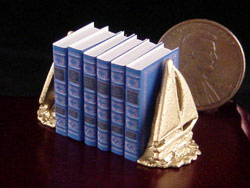 Beautiful metal sailboat bookends finished in 18k gold leaf. 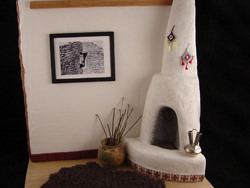 A lovely addition to any miniature home. 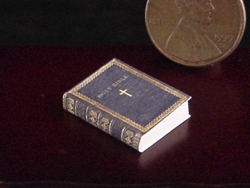 ¾" (19mm) tall. 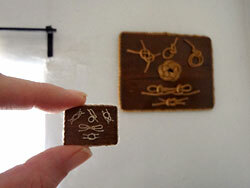 A 1"-scale miniature New England sailor's knotwork plaque modeled after a real one made by my grandfather. 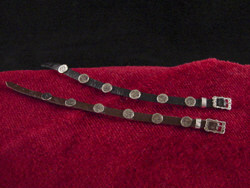 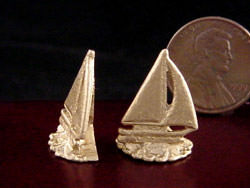 Several common sailor's knots from the original plaque are reproduced in miniature. 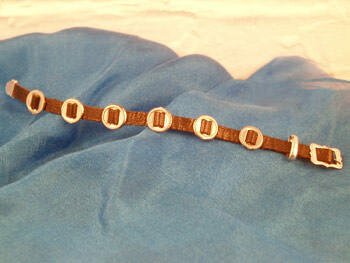 Each tiny knot has been accurately handtied and mounted on the finished wood plaque. 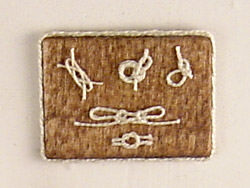 The plaque is 1" x ¾" (25x20mm) and has a twisted rope border. 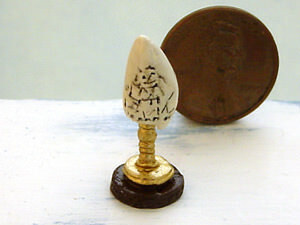 Beautifully detailed 1:12th-scale scrimshaw on a stand. 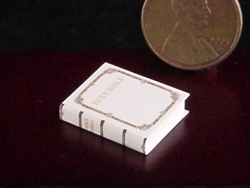 Handpainted to look like real aged ivory. 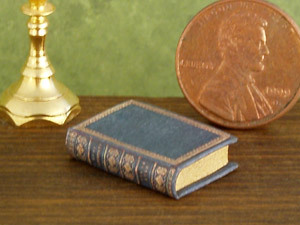 The base is finished with 18k gold leaf. 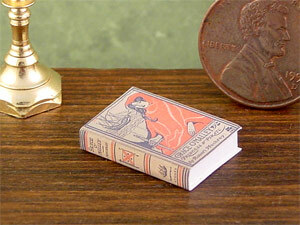 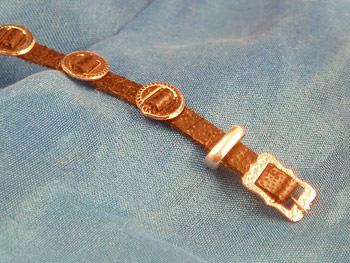 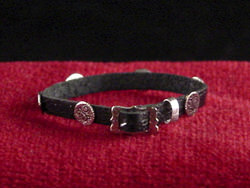 The entire piece measures just over 1" tall (22mm) including the stand. 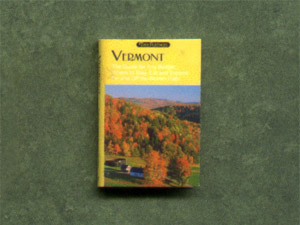 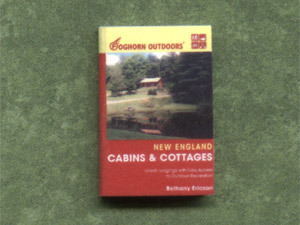 Colorful 1:12th-scale version of a New England travel guide written by one of my oldest friends (you can buy a copy of the real one here. 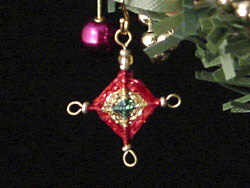 Traditional southwestern 'God's Eye' ornaments in 1:12th scale for your miniature Christmas tree. 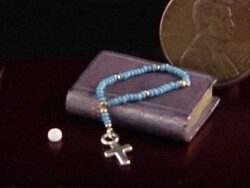 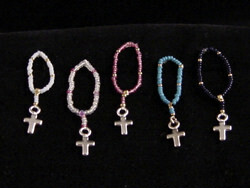 Three bands of handtied metallic thread shimmer on gold wire, accented by tiny antique Italian glass beads. 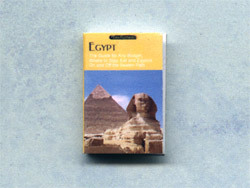 Approximately &frac58;" tall by ½" wide (15x12mm) including end loops. 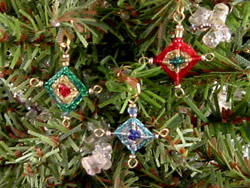 Your choice of Green & Gold, Blue & Silver or Red & Gold. 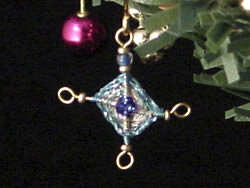 Regular yarn-style Ojos available separately. 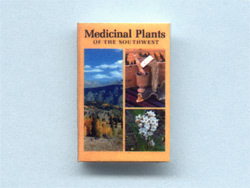 1:12th-scale herbal book for your miniature gardening or southwestern scenes. 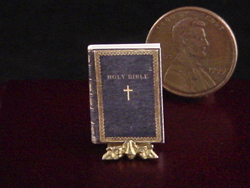 1:12th-scale blank miniature Bible, available in black or white. 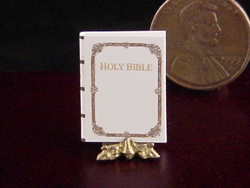 The cover and spine are lavishly embellished with beautiful gold designs and the words "Holy Bible." 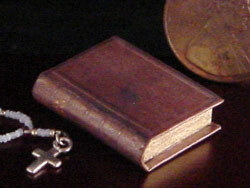 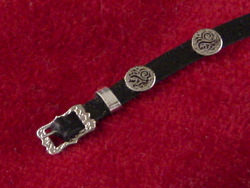 The black version also has a gold cross on the front cover. 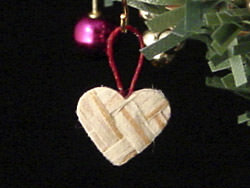 Based on traditional Swedish woven hearts, these tiny ornaments are made from woven straw with a cheerful red hanging loop. 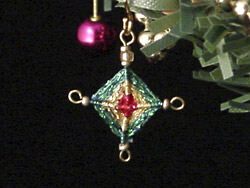 A beautiful addition to any miniature Christmas tree! 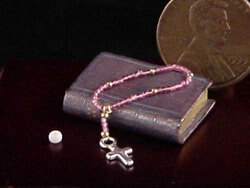 Hearts are 5/16" (8mm) tall, plus hanging loop.